Deloitte's Sales and Operations Planning (S&OP) is an integrated business management process developed to help organizations to plan the demand and marketing spend and effectiveness. It is a cross-functional, collaborative process that focuses on improving business performance and includes a forecast that leads to sales plan. Built in workflow and visibility on the forecast entries and leads to timely follow ups with alerts the managers to focus on specific region or sub-region to address causes for the delays in the reporting. The planners will be able to enter YOY growth% by brands for all regions and aggregation of the data is presented by region and brand separately in terms of sales value. 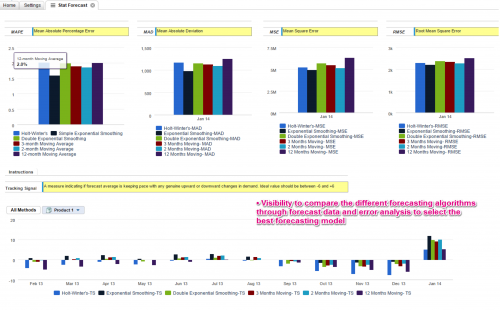 Displays the forecast of the sales based on different statistical forecasting algorithms and flexibility to do what-if analysis based on the S&OP forecasting method data and error analysis to select the best forecasting model. Ability to plan promotions and campaigns by products as part of marketing initiatives to contribute to the sales volume. Ability to perform top down planning by distributing the product sales by different region and sales channels. Flexibility to do bottoms up planning and comparison of sales volume allocation at regional and area level and align sales targets to company growth objectives through sales forecasting for products at granular operational level. Visualizes annual plan vs S&OP plan in different dimensional views including region, distribution channel and brands. Alerts to the stakeholders of achievement of S&OP model vs the annual plan for timely management discussion and feedback to improve the process.